The other was For Peter Pan on Her 70th Birthday at Playwrights Horizons, a rare misfire for playwright Sarah Ruhl. 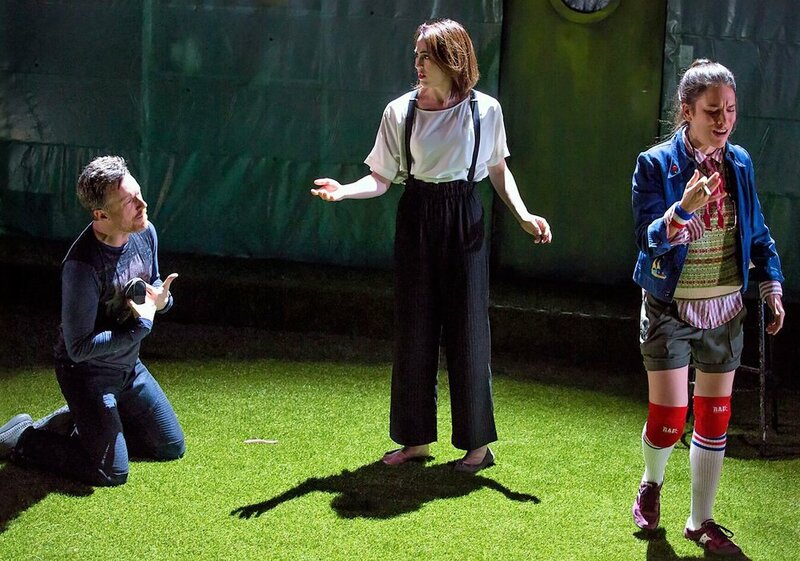 Stumbles are to be expected as innovative artists search out new forms, but Bedlam’s equally ill-conceived adaptation makes a strong case for putting Peter Pan to rest, for at least another 113 years. 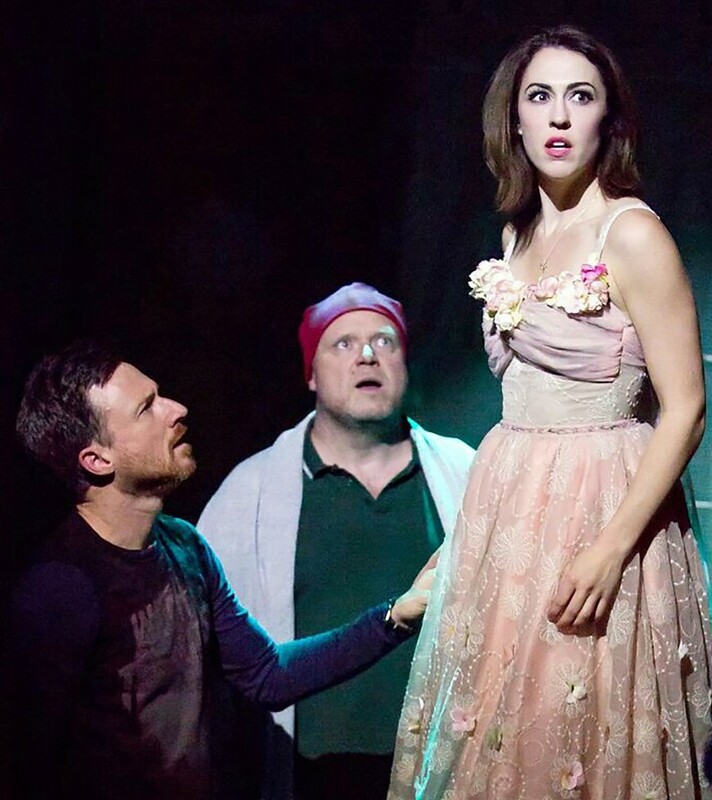 Zuzanna Szadkowski and Brad Heberlee in Bedlam's hectic Peter Pan. Top: From left, Heberlee, Kelley Curran, and Susannah Milonzi. The familiar story beats are all there: Peter Pan (Brad Heberlee) takes Wendy (Kelley Curran), Michael (Edmund Lewis), and John (Susannah Milonzi) Darling to Never Land, Wendy becomes mother to the Lost Boys despite the best efforts of a jealous Tinker Bell (Milonzi again; her saucy fairy speaks French), Peter fights his nemesis, Captain Hook (Bedlam artistic director Eric Tucker, also the play’s director), and the kids return home when they realize they’re forgetting their own mother. Barrie gets credit for this adaptation, but he’d probably say, “Nah, I’m good, thanks,” if he were alive to do so. The dialogue is mostly his, but Tucker has put a wicked spin on it, changing the emphasis of lines to bring out the story’s psychosexual undercurrents. “He was trying to get in, George,” Mrs. Darling (Zuzanna Szadkowski) tells her husband after seeing Peter at the window. Wendy: “I did nothing.” Peter: “You did a little.” They’re talking about sewing Peter’s shadow back on—and a whole lot more. It’s very funny (especially when Szadkowski and Tucker engage in a bit of Peter Pan roleplay as Hook and Smee), until it’s not. Like any joke, the more it’s repeated, the less funny it becomes. Tucker and company throw everything at the wall to see what sticks. As the show goes along, junk piles up around the stage—Christmas tree, confetti, garbage, an inflatable pool—in a literal manifestation of the crust of mixed metaphors, character doubling, and recursive plot fragments piled willy-nilly on the play, effectively negating any hope of emotional or intellectual engagement. The show wants desperately to say something, but it talks a lot and says very little. There is one moment of transcendence. The most exciting part of any production of Peter Pan is the flying, and this version is no exception, except that the company makes magic by doing nothing. Heberlee simply stands, and the others look on, expressionless. The stage and actors become a blank canvas for the audience’s imagination in a way only fiction usually achieves. The moment is strikingly beautiful in its simplicity. It not only captures the wonder of Peter Pan, but it also makes the rest of the play’s action seem over-busy and extraneous by comparison. Heberlee (left) with Edmund Lewis, and Curran. Photos by Jeremy Daniel. John McDermott’s set is a Peter Pan–colored AstroTurf army barracks, with plenty of windows, nooks, doors and stairways for the cast to clamber over and through. Charlotte Palmer-Lane’s costumes are as eclectic as Tucker’s directorial and musical choices. 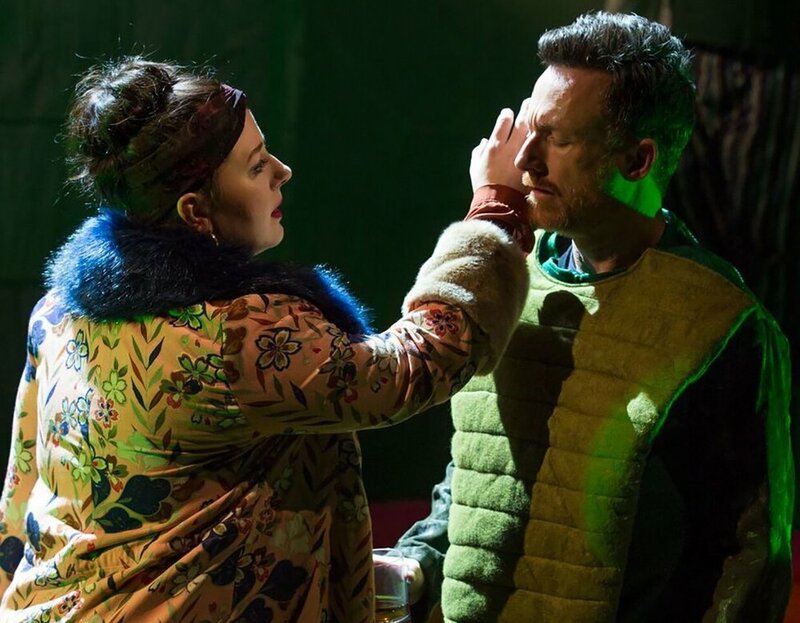 The play has all the ingredients of a good time, and the able cast seem to be enjoying themselves, but the whole affair comes to a thudding crash as it attempts to turn thoughtful. This is largely true of any production of Peter Pan; the second half, with its odd Freudian undertones and glum return to the nursery, can never match the excitement of the discovery of flight and Never Land, second star to the right and straight on till morning. Still, it overcomes this late malaise with a trick as brilliant as it is devious, goading the audience to applaud to bring Tinker Bell back to life. Bedlam almost redeems Barrie’s manipulative moment and the production itself when Tink doesn’t rise despite the audience’s best efforts. You can clap and believe in fairies all you want, the play seems to be saying, but you can never get back what’s lost. But then Tinker Bell stands up and saunters off; she was just throwing a fit. Maybe it’s time to grow up. Bedlam’s Peter Pan runs through Dec. 23 at The Duke (229 W. 42nd St.). Evening performances are at 7 p.m. Tuesday through Thursday and Sunday, and 8 p.m. on Thursday and Saturday; matinees are at 2 p.m. Saturday and Sunday. For tickets and information, call (646) 223-3010 or visit dukeon42.org.